Physical Address: 1000 Jackson Rd. Mailing Address: 1000 Jackson Rd. Atco, NJ - Atco Dragway racers gathered up 60 points in the Team Championship and held off Maple Grove Raceway who finished second at 57 followed by Island Dragway and Lebanon Valley Dragway at 44 and 43. Atco, NJ - Other racers visiting the winner’s circle this weekend were Doug Doll, Douglas, Mass., in Comp Eliminator; James Antonette, Wantagh, N.Y., in Super Stock; Anthony Fetch, Colonia, N.J., in Stock and Kyle Rob, Denver, Pa., in Super Street. Atco, NH - In the MXI/Magnaflux Top Sportsman and Top Dragster presented by Select Performance it was Jeff Brooks and Christopher Wilson taking home the hardware. Brooks, Fredericksburg, Va., pocketed his second of the year as he beat out Brian Conrey running 6.726, 202.36 in his ’51 Henry J. Wilson, Lincoln University, Pa., won over Mike Sullivan with a run of 6.405, 197.10. Atco, NJ - The other drivers visiting the winner’s circle were John Calo, Glen Head, N.Y., in Super Comp; Francis Ross, Milford, N.H., in Super Gas; Ronald Riegel, Fairless Hills, Pa., in MXI/Magnaflux Top Sportsman presented by Select Performance, and Vince Musolino, Bridgeport, N.Y., in MXI/Magnaflux Top Dragster by Select Performance. 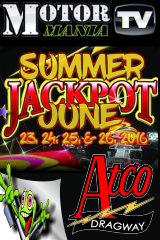 Atco, NJ - Live Coverage all weekend long from Atco Dragway of the Summer Jackpot. Watch as all the East's Big Money Bracket Racers take their crack at $20k plus. CLICK HERE for Video and Audio. Atco, NJ - It was a 19 year comeback win for Keith Mayers, Middletown, Del., who took his second divisional trophy in Super Street in defeating Shawn Fricke, Flemington, N.J. Mayer’s last win came at Cecil County Dragway nearly two decades ago. Delmar, DE - Atco Raceway captured the team championship and four racers are headed to the NHRA Summit Racing Series National Championship with victories this weekend at the NHRA Northeast Division Summit Racing Series Finals. Atco, NJ - Due to rain being an issue this weekend at Atco Dragway, not all the classes were able to complete their final rounds as the rain ended racing for the weekend. This race will be completed at Cecil County Dragway, Friday, August 15th. 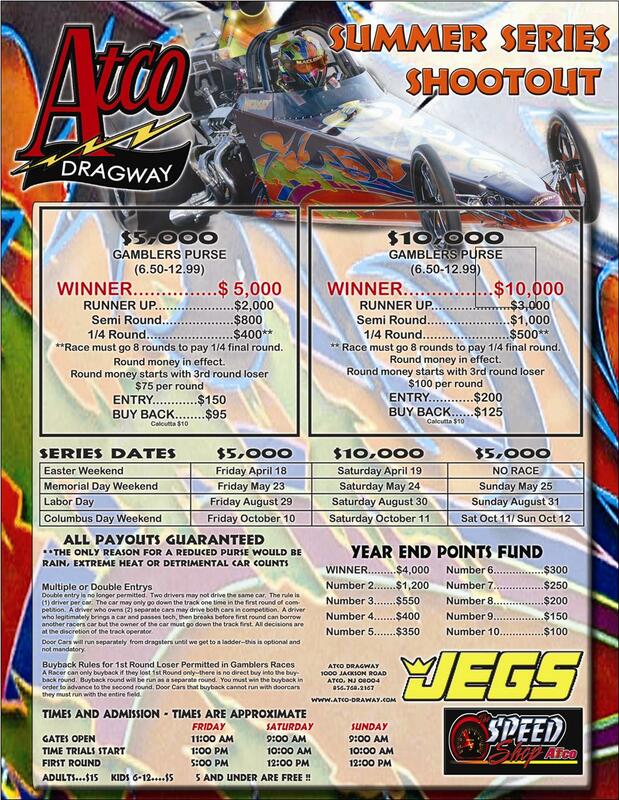 Atco, NJ - The Summer Series Shootout returns to Atco Dragway for 2014 beginning this weekend. 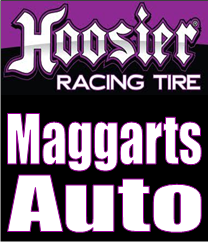 All payouts are guaranteed and as always the series includes a year end points fund presented by JEGS worth $4,000 to the overall winner.